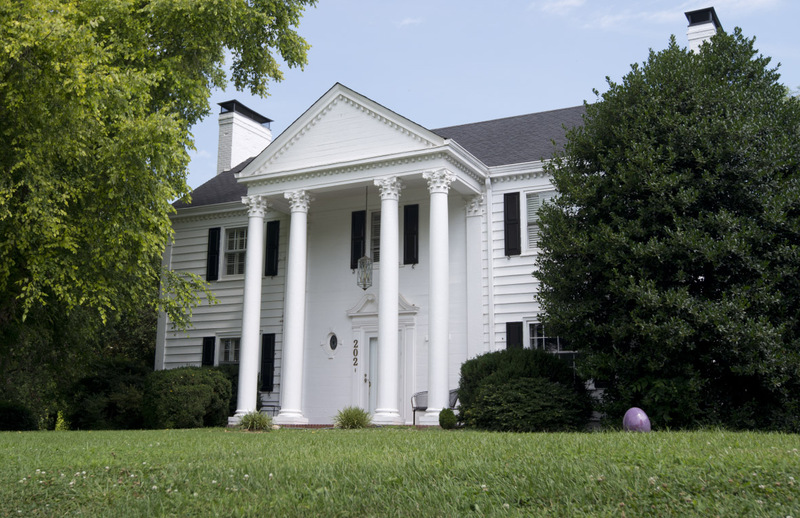 One of the few Neoclassical Revival-style houses in Hillsborough, this two-story, side-gable, frame house is three bays wide and double-pile with a monumental portico centered on the façade. The building has plain weatherboards with flush sheathing under the portico and a painted brick veneer and exterior chimneys on the gable ends. It has eight-over-eight wood-sash windows and a denticulated cornice with cornice returns. The replacement front door has a classical surround with pilasters and a broken swans-neck pediment and is flanked by small oval windows. It is sheltered by a two-story, pedimented portico supported by full-height Corinthian columns with a denticulated cornice and dentils in the pediment. There is a two-story, hip-roofed wing at the rear with wide weatherboards. A one-story, shed-roofed porch on the right (east) elevation is supported by tapered square columns with a dentil cornice at the roofline. There is a painted brick retaining wall along the driveway, just west of the house, and stone steps access the property from the intersection of West King and North Wake streets. According to a sign in the yard, the house is the Dr. Efland Forrest House from c. 1938.